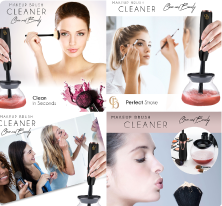 For our client who sells makeup kit cleaner, it was mandatory for them to take appealing pictures of their product and to make it reach to the targeted potential buyers. We made use of several female models and captured various pictures of them using the product to express how useful it is. Highlighted features of the product are also put up in texts, creating less dependency on the description.